The circumstances of Life in the Boomer Lane’s jet set lifestyle involved Now Husband making a reservation at a hotel near the Newark Airport, picking her up at the airport, and driving to the hotel. LBL will give you no other details about where she was coming from, why she and Now Husband had to stay near the airport, or where they were going next. This is out of consideration to you, the reader. Were details to be given, you would most likely reassess the details of your own paltry lives and find them seriously wanting. Now Husband, for a reason known only to himself, chose a hotel that had the following reviews from most people on Trip Advisor: Good hotel, but you won’t find it from the airport. Now Husband decided to test that out, using LBL as a hapless passenger in his car. The plane arrived at 11:30PM, a great time for panhandlers to wait in baggage for unsuspecting travelers. LBL didn’t ask the panhandler (P) how he got to the airport, but whether he drove or took a cab or courtesy shuttle, he had to cover expenses, which would make his job a bit tougher than the average money-seeking street person. From baggage, LBL walked outside and enjoyed watching all other passengers get picked up. Finally, the only people remaining outside the door were herself and P, who was waiting for his taxi. Now Husband, told by LBL that she was at Terminal B, was waiting at Terminal C. LBL and the panhandler cemented their new relationship by exchanging cell numbers and promising to keep in touch. Part A (20 minutes): This involved Now Husband trying at least four different ways to get to the hotel. Each way resulted in LBL’s observation that the hotel was on the opposite side of the highway from where they were, with no way to get to the other side. She is fairly sure there was a Twilight Zone episode like this, which involved the heroine never being able to get to her hotel and missing out on the Continental Breakfast she always looked forward to. LBL moved as far away from him as her seatbelt would allow and tried to whisper further names of streets to the desk clerk, while Now Husband continued to shriek and froth. Suddenly, Now Husband swerved over and stopped the car. LBL considered escaping, but her suitcase was in the trunk and she couldn’t go anywhere without her blow dryer. She kept her cell on, so the desk clerk could testify at the trial later. LBL still doesn’t understand how this happened, but she is pretty sure that the same thing happened at the end of the Twilight Zone episode, where instead of a hotel, the woman keeps arriving at the cemetery until she realizes she is actually dead. LBL didn’t think she was dead because she was hungry. Readers will be relieved to find out that Now Husband and LBL slept at the hotel that night and not on a random grave, although they now believe that the entire state of New Jersey is to be avoided at all cost. In addition, LBL will always carry her blow dryer in her hand when she is traveling in a car with Now Husband. What is it with New Jersey? You’d think they would do everything they could to make it easy for people, instead of discouraging them. Sorted tea up my nose on this one! I think I’ve been to that hotel. It’s in hell. I like to cause snorting of hot beverages. This was priceless – and as with all things related to New Jersey (though my own beloved is from there), the best one can do is head to to the ‘right’ side of the river. Your husband is my husband’s twin! I must remember to keep the blow dryer accessible. Good tip. I’ve been lost like that near Newark Airport without the expense of a GPS. I think that it is wise practice to avoid New Jersey if at all possible. And when going there, be sure to leave somebody’s body behind. That’s why the graveyard was so conveniently located. Hah, we used a GPS on our boat today, and the coordinates were apparently right but the GPS was not calibrated. So instead of diving a beautiful dive site we went down and had a swim around what looked a bit like an underwater cemetery. 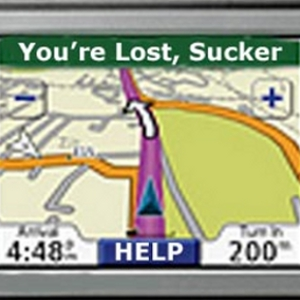 GPS’s are a woman’s best enemy! GPS’s have to be calibrated? Llike ovens? This is all too complex for me. Plus, the word calibration makes me hungry. Excuse me while I hit the refrigerator. Still laughing….and it’s hard to comment with chuckles bursting through the comment. I have never been to Joisey with my beloved, but we have been through quite similar situations in other areas of the world. I find it fascinating that it is ALWAYS the woman who is “wrong”, causing the man to end up in the wrong spot. I, too, will make sure the hair dryer is on my person whenever driving to a new location with my husband. Hope the rest of the trip was better than this episode. Part 2 would be trying to find my daughter’s place in Brooklyn after I entered the WRONG address into the GPS. This is way, way too funny. And I’m almost positive there is the exact same cemetary at National airport in D.C. by the rental car return. Been there. You are indeed a treasure! I live in Arlington (VA, not TX) and there is, indeed, a cemetery near Natl Airport. There is also the Pentagon, with all its crazy security. So you can arrive, get lost, get shot at, and get buried all in the same general location. What IS up with New Jersey? I was looking at the rules to enter a photography contest and anyone could enter except people from Cuba and New Jersey (I’m serious); what the heck is that about? So, are you going to tell us why you were there, anyway? Hilarious. I need to read an entire post about this. Is New Jersey Communist now? I was in Seattle for a week, with my two week old granddaughter (her parents were there, as well), then on to Brooklyn for my grandsons’ birthday parties (ages two and four). A great trip, except for the getting lost part. I have often said that it is a good thing there are no drive-through divorce booths on freeway exits. A lawyer would make a killing, particularly if the booth is on the passenger side of the vehicle! Oh, funny. You could do a post about that. Drive through divorce booths on the exits. I seriously like that. Very funny! Definitely been in that situation. I hate my GPS with a passion. Sometimes I will test it and plug it in to get somewhere I already know how to get to just to see the horrible advice it gives me. When I am traveling I don’t know any better, but when I see my GPS suggestions for getting out of my own neighborhood…it’s scary. Been there. I find it’s best to use it when I have no idea where I am and no knowledge of who I am. That way, I just mindlessly follow the directions, happily making u turns all over the place (that is my GPS lady’s favorite thing to tell me to do) and not caring if I ever arrive at any specific destination. I was once lost exactly like this outside of Detroit, so lost I started to cry. The roads there force U-turns. GPS was rented from the Car Rental place and someone had made it speak in the voice of Darth Vader. It scared me, there were no street lights. I finally had to call my friend whose husband came and found me and led me back to their house. It was terrible. I will have to remember, never drive in New Jersy. Poor you. I have a theory that goes like this: If I get lost, my car will immediately find a neighborhood that has a “Checks Cashed” emporium on every corner. Then the sun will go down (even if it is 10AM). Then my cell will run out of power (even if I have just charged it). This actually happened to me in Philly one night, plus I got stuck on a street with trolley tracks. Talk about crying…. I once went to Philly for one of my siblings weddings, I was working in Conneticut at the time. So stayed the weekend with my Dad and on Sunday asked the best way to get back to CT (this was before GPS). He sent me down 95 and across the GW bridge through NYC and Harlem, which I hit at 1am, there was of course a traffic jam. Talk about good luck. He asked me to call him when I got to the hotel. It was 4am, I called anyway. I asked why he sent me that way, he said it was the sortest route and he knew I was smart enough to keep my windows rolled up, my doors locked and not get off the freeway. He also said, he wouldn’t let any of my other sisters drive alone. Your writing is HILARIOUS! A few years ago the Miami Internation Airport apparently decided to go on hiatus or something. I do mean the airport…. the whole bloody place.The signs directed one to the parking lot which was then blocked off with constructions signs. So around again we drove, thinking that surely they had a better plan for parking than just skipping it altogether. We were wrong. I have no idea what in the heck they wanted us to do. After a couple more laps, we parked in the no parking lane. I guarded the car with a vicious look on my face, daring the airport cops to even get near me. They did not. Thanks and welcome to my alternate universe. I’m sorry to hear your story. I haven’t had much luck with airports in general. Last year, I got my arm stuck in an airport vending machine. Because the airport was technically closed, I got to extract my arm by myself. Airports are scary places.
. If it is going to happen… it will happen to me. 2. It will be ridiculous. 3. Sadly, there will be witnesses. That is hilarious! I once went somewhere with friends. The driver wasn’t sure of how to get home, so I turned on my cell GPS. I guess my other friend didn’t trust my cell because she then turned on hers. One was a beat behind the other, so directions echoed all through the car. I could have turned mine off but I was first and I was pissed. So that’s how we drove home. This is fantastic. I mean, awful. I just got lost going to and from EWR last night and I live here, for Pete’s sake, and have made this trip more times than I can count. Getting lost in Newark is awesome.